Intro serves you as your introduction to Cusco. It´s known for been a real social place (activities and layout helps) but chill out too. In our converted 300 years old mansion, we emphasize a Social experience but where you can also have a good sleep (bar closes at 11pm). We are located in the Historic Center of Cusco, just blocks from the Main Square and really close to everything this astonishing city has to offer. We have a 72 hour cancellation policy. CASH ONLY. We only accept payments in US dollars or Peruvian Soles. Check -out : 12 am. Intro Hostel was the most fun I had on my trip! Everyone was so welcoming, happy, fun to be around. They went above and beyond to celebrate my birthday and I cannot thank you enough! They made the trip very memorable. Wonderful place. For me it's the best hotel I've stayed at in SA and comparable with some of the best Japanese hostels. Clean, comfortable, exceptional staff lockers and plugs near the bed, no nasty door bell, very good laundry service. Loved the entire vibe in this hostel . The moment you walk in , you don’t feel claustrophobic as the entire hostel is very apt to designed with lots of open space and place for natural light. Various activities and good breakfast. Clean room and bathroom .In-house travel agency. And less than 10mins walk away from main plaza. Super nice ! Bed comfy, great common area, staff very helpful, very clean. I would recommend the place. Staff at this hostel were some of the friendliest and most helpful I have come across on my trip! They went out of their way to make sure I had a great stay - even making me a cup of tea when i wasn't feeling well! Legends! The location is great (yes it's up a hill from the square but if you take it slow the altitude shouldn't affect you too much!) Common areas were clean and beautifully decorated. I stayed in a dorm - the bed was super comfy and the bathroom was massive. It's an amazing hostel with great vibes! One of the best I've been to so far. 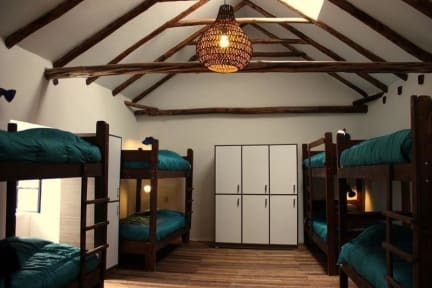 The dormitories are very comfortable, beds are cozy, there are electric pockets in the lockers. Bathrooms are clean, there are a lot of comfy sofas and armchairs to rest, the breakfast is really good. There's a great bar on the second floor, where there's something going on every day. It's very easy to meet new people, the staff is extremely friendly. Overall the hostel is awesome. The staff, the rooms, the bathrooms. Everything is comfy and clean. Highly recommended. In the 6 bed dorm it was kinda cold and in the 14 bed dorm it was better. Since after all cusco was kinda cold during the night and evenings I kinda missed a room where you can hang around. There is an area outside but later the day it got to cold to stay there. But still the hostel is super awesome! good breakfast of pitas and jam, puff cereal, milk, fruit, and unlimited coffee and tea. Good showers with hot water and hooks to put clothes, good bathrooms stocked with toilet paper. Beds are good. Lockers available. Atmosphere is very quiet. Several people sleeping in hostel rooms during the day. Cons: I arrived at 6 am from a long flight and was told I could not get a bed until 1 PM. I was so exhausted so I just slept on a chair inside. Also there was a couple in the top bunk noisy. The hostel is 10 min away from plaza de armas, the private rooms aren’t cozy. The showers are far from the rooms and you have to cross an open area to get there ( in Cusco this time of the year is really cold).